This is it. This is the volume of Wolverine and the X-men I was waiting for. 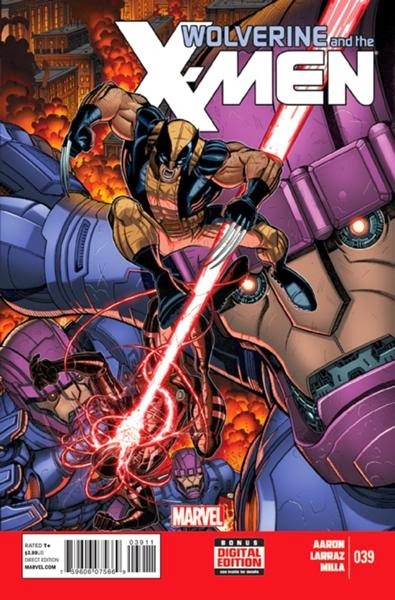 Volume 8 collects Wolverine and the X-men Annual #1 and issues #38-42. This is the last volume of the series before it got rebooted and it’s the best volume of the series since the first two volumes. With this final volume the Jason Aaron and the artists demonstrate once again what the series is about. It’s also nice to be able to look at the series as a whole. After concluding my reading of Wolverine and the X-men it is clear to me that the series is yet another example of how the modern climate of superhero comics negatively affected the quality of this and other comics. Wolverine and the X-men has been disrupted by event storylines on three occasions. 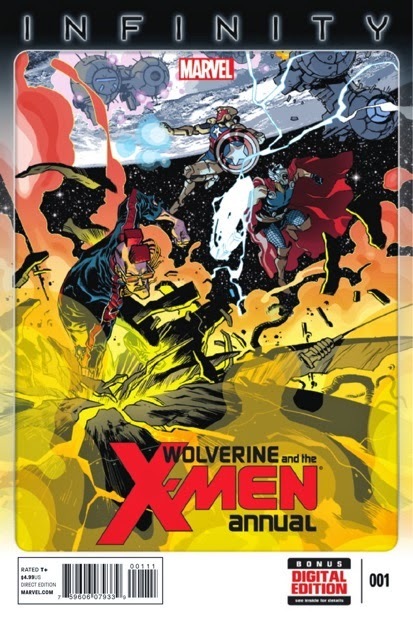 Several issues where spent telling tie-in issues to Avengers vs. X-men, two issues completed wasted as part of the X-men: Battle of the Atom event, and finally the annual issue was linked to the events of Infinity. Thankfully for two of these events (Avengers vs. X-men and Infinity) Aaron was able to tell engaging stories despite editorial requirements to make his story work in tandem with the larger story of the Marvel Universe. The downside is that it completely undermines any momentum the series had built at the time the event storylines intruded. The annual issue is a good example of how Aaron tells a well-crafted story while also meeting the requirements of a tie-in issue. The issue is set during the time of the event comic Infinity. I haven’t read it but it appears as though there was an intergalactic conflict of some sort between ancient beings who allied themselves (I think) to Thanos. Their goal, naturally, is the destruction of Earth or some such thing. Instead of focusing on the larger story of Infinity, Aaron uses the galactic conflict as a backdrop to tell an engaging and heartfelt story about Kid Gladiator, son of Gladiator of the Shi’ar Empire. The story develops his character while also solidifying it since his behaviour remains consistent with how he’s been portrayed since the beginning of the series. Aaron gives you just enough information regarding the plot of Infinity to help you understand what is going on in the comic but, in the end, it doesn’t really have to do anything with that series. It’s simply a story about Kid Gladiator (real name Kubark) and how attending the Jean Grey School for Higher learning has changed him. The annual issue also reinforces one of the themes of Aaron’s run which is that mutants aren’t specific to humans or to Earth. He broadens the idea of what a mutant is or can be. 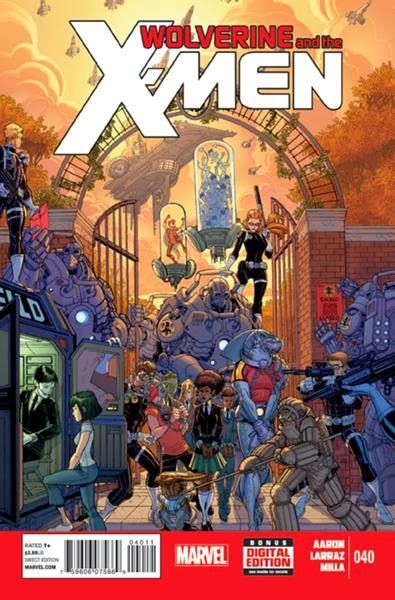 Aaron even goes so far as to demonstrate the idea of what mutantkind by focusing on the element of being significantly different than other people in your social surrounding or being completely unique. By comparing the social and political structure of the Shi’ar Empire and that of Earth, specifically Wolverine’s school, Kid Gladiator realizes that mutants’ celebration of individual and collective differences is what makes them better people. It’s personal growth through mutual understanding and appreciation. I can’t remember the last time I read an annual issue that worked so well on its own and also skilfully developed the series’ themes. It’s a stellar issue and Nick Bradshaw kills it on the art. It’s bombastic, as befits a story focusing on Kid Gladiator smashing enemy spaceships in space. There are tons of explosions and space battles while also having quite a bit of uniquely designed characters which Bradshaw illustrates very well using his signature style. 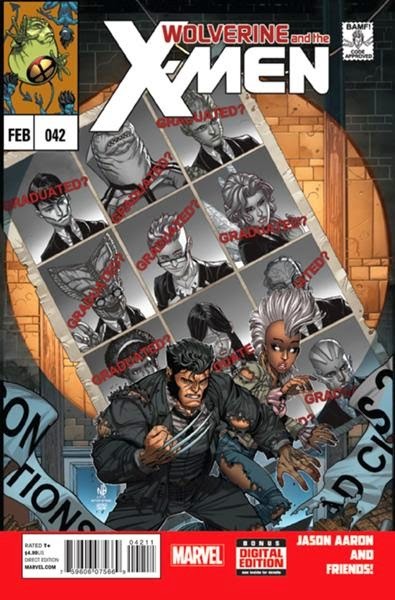 The second story is titled “The Wolverine School for Gifted Youngsters”. It is pencilled by Pepe Larraz and it’s quite good. The first issue of this three-part story does two things. It set-ups the new story while also re-contextualizing the series, its characters and the setting of the school. The last storyline before the annual, “The Hellfire Saga”, did a poor job of using some of the main students and new characters from throughout the series. Aaron fixes that mistake by giving most of the characters a couple panels in which to shine. It’s a good way to reacquaint the reader after the interruption of the two tie-in issues of Battle of the Atom. As for the rest of the story, Aaron uses a minor plot element of Uncanny X-men (Mystique has infiltrated S.H.E.I.L.D. by impersonating mutant liaison and former X-men Dazzler) to setup his conflict between the Jean Grey School and the superhuman policing force of the Marvel Universe, S.H.I.E.L.D.. It’s a quick and efficient way to setup conflict. These issues, much like the annual before it, do a great job of bringing back some much needed thematic relevance to the series. Aaron is in top form with these issues and he brings forth the idea that the X-men’s inclusiveness and willingness to forgive and offer second chances results in a grouping of rather dangerous, albeit very friendly individuals. However, as Maria Hill, Commander of S.H.E.I.L.D., points out it’s difficult to tell who is dangerous and who isn’t when looking at the X-men from an outside perspective. Aaron shows us this dichotomy in perception during the covert conversations of two new students at the Jean Grey School: Tri-Joey and Squidface. They’re undercover operatives working for agent Dazzler. They’re using Mutant Growth Hormone to give them mutant abilities in order to disguise themselves from students and faculty. While Tri-Joey is reeling from the beauty and the overwhelming positive feeling of the school Squidface is reacting more negatively. She’s buying into her preconceived notion of mutants and the Jean Grey School and she’s refuting all evidence that the school is actually a great place and a safe haven for mutants and anyone who agrees with their values of acceptance and celebration of differences. While the students are defending their way of life inside the school, Wolverine is destroying warehouses full of Sentinels after being informed by Maria Hill that S.H.I.E.L.D. is stockpiling sentinels in case mutantkind should ever get out of hand again, like they recently did during Battle of the Atom. The third story is illustrated by by Pepe Larraz and Todd Nauck and is called “The Heart of a Toad”. As the title suggest it focuses on one of the background characters: Toad, the school’s janitor. For having contributed to the events of “The Hellfire Saga” Toad is fired from his position at the school. We follow him briefly as he attempts to make good with the second chance Husk gives him only to fail and fall back on more sinister lifestyle; a lifestyle he’s more familiar with. It’s a sad story but it fits well in this volume. It provides the flip side of a lot of the themes in the other stories which focused on the students. Many of the students have done terrible things in the past (Idie, Quentin, Broo) but they’re all given the opportunity and the encouragement to better themselves and try again. There is an element of hope and unfulfilled potential that the adult characters attribute to the young students. Unfortunately, the same kind of treatment isn’t given to Toad and without encouragement or a support group (other than Husk’s attempt) he quickly falls back on hard times. This story does a good job of wrapping up Toad’s arc and it solidifies his link to the rest of the series. The fourth story is made up of the final issue of the series before it got rebooted. Tons of people contributed to the art: Nick Bradshaw, Pepe Larraz, Ràmon Pérez, Shawn Crystal, Steven Sanders, Nuno Alves, Tim Townsend and Chris Bachalo. Titled “Congratulations, You Survived the Experience”, this is more of an epilogue as there isn’t much in the way of conflict. We’re given a look at a possible future for some of the main students. These futures are intercut with scenes in the present day where Aaron gives us nice character moments. It’s a quiet story but it’s well executed and it adds weight to the final issue of a much loved run on an X-title. It is bittersweet, that’s certain, and I hope that Aaron gets the opportunity to write another ongoing X-men title later in his career since I found him to be really good. Appropriately, the final volume of Wolverine and the X-men is about ending the series and wrapping up plot threads. It’s surprising how much emotion and fun Aaron instils in these issues. The series has focused on growing up, learning to accept your responsibilities (most often seen through Wolverine’s viewpoint as a surrogate parent and a role model), accepting who you are and creating a space where you belong. Every single story in this volume reflects that and while it feels like an ending, it also feels like a continuation of what’s come before (as it should) and I also provides a glimpse at potential future stories. Kid Gladiator’s story in Annual #1 is about accepting his love for the Jean Grey School. The second story is about the students collectively acknowledging the same thing but also putting in practice the most important lessons they learned at the school: accepting others and celebrating their differences. They fight the villains in this story not with their fists but with open arms. The third story focused on Toad and second chances. Most of the characters in this story have had more than one second chance but unfortunately not everybody gets to prove their worth after screwing up. It’s a slightly darker story than the rest in this volume but its inclusion strengthens the series’ themes by providing an example of a life that has been marred by continual hatred and abuse. The final issue tops it all off by demonstrating that you can indeed learn, grow, and change for the better and in some cases (like Quentin) you’ll become a better person without even realizing it’s what you wanted to be all along. I’m sad to see this series go, especially after such a great volume. This is what superhero comics should aspire to be and we get so few of them now because superhero publishers are busy pretending to tell meaningful crossover event stories while being blind to the storytelling potential of regular serialized ongoing series.